For home cooking, there are a few things that you usually buy pre-made and aren’t really considered convenience foods: bacon, puff pastry, and sausage. Except, I decided that it would be fun to make my own sausage. And that’s when I realized I was a real foodie. It’s not as if I don’t have access to quality sausage (the local butcher shop makes their own even if they seem to run out of hot Italian sausage before I can ever buy it). It really was a crazy idea. In my defense, I did get the food grinding and sausage stuffing attachments for “free.” My employer offered a $50 gift certificate for completing a short health survey that I then applied to sausage making equipment. 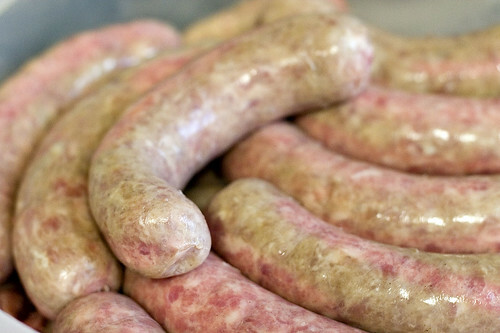 Bratwurst isn’t the first batch of sausage that I made. That honor would go to garlic sausage that ended up too garlicy and not salty enough. That’s also when we found out that Angela is much better at feeding the meat into the casings than I am (I get to push the meat into the stuffer). Will had planned an Oktoberfest themed Halloween party and I offered to bring homemade bratwurst. On the Monday before Halloween, Will came over for dinner and documented the process (all images except the top one are Will’s) of sausage making. It’s amazing the number of sexual innuendos you can make when making sausage; particularly when part of the process is done by your wife. Making sausage is actually pretty easy as long as you have the proper equipment. I use a KitchenAid Mixer with the Food Grinder Attachment and Sausage Stuffer Attachment. The key issue is keeping everything really cold at all times. This is particularly true for the grinding portion or the fat will start to melt and the grinder won’t work anymore (this happened the first time I made sausage; I didn’t have the meat on ice and towards the end the grinding die kept getting gummed up with melted fat). So how good was the sausage? Good enough that we didn’t remember to take any pictures of the bratwurst when it was cooked. Good enough that all that we cooked was eaten (and we made extra). Good enough that people wanted to take some home with them. Good enough that Angela, who doesn’t particularly like sausage (which means that I’m even crazier for wanting to make sausage), loved it. It was the best sausage I’ve had and that includes some in Germany and Austria. So, I’ve made sausage and I have some panchetta curing (which is close enough to bacon for me). I suppose I need to make some puff pastry at some point. Combine all ingredients except eggs, cream, and casings in a large bowl. Toss to distribute the seasonings evenly. Cover and refrigerate overnight. Place the hog casings in a bowl of water and refrigerate overnight. Several hours before grinding, place the food grinder, mixer bowl, paddle attachment, and any other attachments in the freezer. Remove the meat mixture from the refrigerator and place in a bowl of ice and salt. Grind the mixture through the small die into the mixer bowl set in a bowl of ice and salt. Beat the mixture with the paddle attachment on low speed for 1 minute. Add the eggs and cream and increase speed to medium. Mix until the mixture is uniform. Refrigerate the bowl until ready to stuff. Sauté a small portion of the sausage in a small bit of oil and taste for seasoning. Remove the hog casings from the refrigerator and rinse both the inside and outside of the casings in running water. Setup the sausage stuffer using the largest stuffing attachment. Place meat in the sausage stuffer and turn on to low speed until the meat is just at the end of the attachment. Slide the opening in the casing onto the stuffer and then push the remaining casing onto the stuffer until there is about an inch hanging off. Tie off the end of the casings. Slowly push the meat mixture into the sausage stuffer while holding the casing and letting the meat fill it (this is a two person job). The speed is determined by the speed of the meat being putting into the stuffer not the speed of the mixer. When there is no more casing, tie it off and repeat this step with the remaining casing. Twist the sausage into 6 inch long segments and cut with shears. Cook the sausage to an internal temperature of 150ºF. Makes 5 lbs. of sausage.